The 2019 Pedal Out Hunger Ride will be held Father’s Day weekend, Saturday, June 15th. With the registration fee, riders will enjoy challenging routes, great food, music, door prizes all for a good cause. The first 50 registrants receive a free swag bag, including a commemorative t-shirt. Event participants may buy extra t-shirts while supplies last. The Pedal Out Hunger Ride starts Friday before the ride at the Captains' Fish Fry. Participants who preregister online for the Pedal Out Hunger Ride will receive a complimentary invitation to join us at the Captains' Fish Fry; Friday, June 14, 4:30-6pm. During the Captains' Fish Fry, participants will be able to pick up the Pedal Out Hunger swag bag. The bags include a commemorative t-shirt and special gift prize. If you can’t join us for the Captains' Fish Fry, you can pick up your swag bag the morning of the ride. Parking is available across the street at the County Courthouse, in the parking lot on the corner of High and Dawes, or on public streets. There will be aid stations along the longer routes and mechanical support will be provided by Wheel and Sprocket. All registrants will find a copy of the route maps with aid stations clearly marked in their swag bag. Alternatively, maps can be accessed on a smart device. There will be signs along the route as well to help keep riders on course and direct them to aid stations. Tire pumps, food, and refreshments will be available at each aid station. The start of the rides will be a mass start only. Route maps and start times will be announced closer to the event. 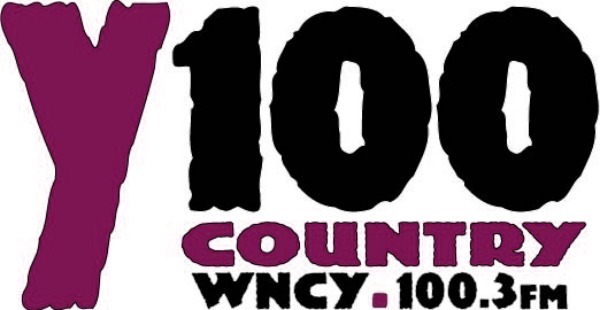 Our morning emcee will be Y100 country radio personality Randy "Shotgun" Shannon. Audio will be provided by Legend Sound. Both the Captains' Fish Fry and the Pedal Out Hunger Ride will be held at The Salvation Army Oshkosh; 417 Algoma Blvd. All proceeds go to support The Salvation Army Oshkosh’s food programs. Nearly one in ten Oshkosh households use The Salvation Army Oshkosh food pantry for emergency food support annually. Approximately 45,000 meals are prepared by our cafeteria each year those who are unable to provide for themselves. 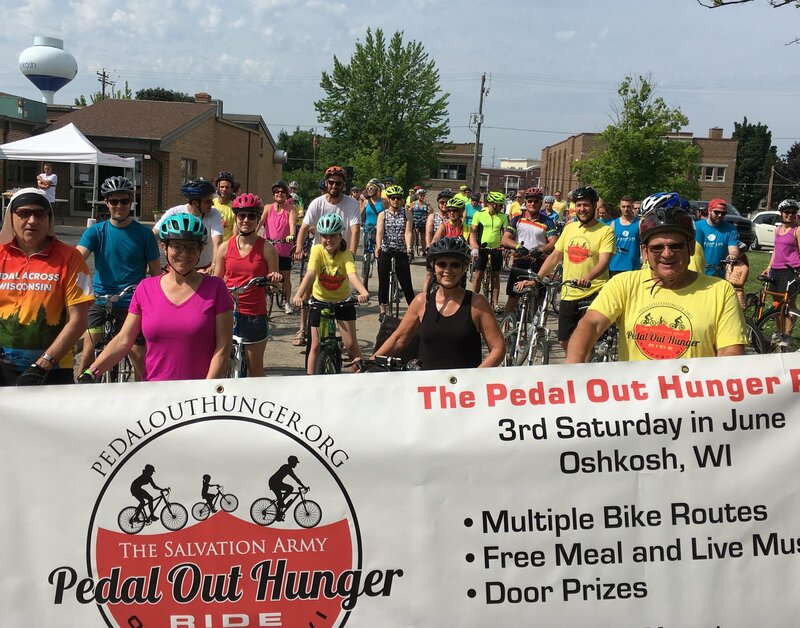 Your sponsorship or participation in the Pedal Out Hunger event will help ensure that The Salvation Army Oshkosh can help meet the nutritional needs of your friends and neighbors. Why not support this great cause by asking family, friends or coworkers to match your miles with a donation? Or have your team challenge another team to see who can raise the most? Anyone who receives $100 or more in pledges will get their entrance fee reimbursed, upon request. Make sure to turn in your pledge form to event organizers the day of the ride. 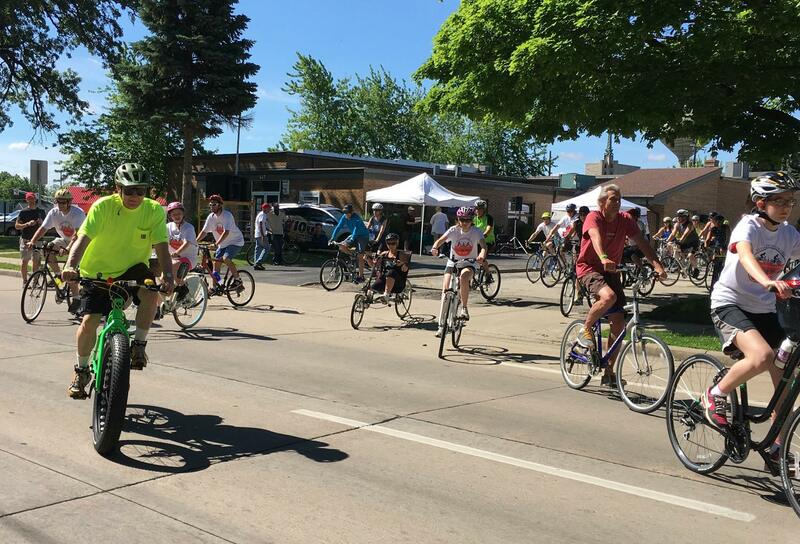 In partnership with the Oshkosh Cycling Club and Wheel and Sprocket, Pedal Out Hunger has five routes for 2019 including 3, 10, 20, 50 and 75 miles. The routes will have varied start times to encourage all participants to return to The Salvation Army Oshkosh for lunchtime, Noon-2pm. Bike helmets are required and must be supplied by the rider. There will be bike stands at the Salvation Army; riders are responsible for providing their own bike locks. The start of the rides will be a mass start only. No early or late departures, please. We will be having a rolling road closure for the first 3 miles of the ride and in order to keep things safe and orderly, we would ask that you depart with the mass start at the designated start times. There will be aid stations along the longer routes. All registrants will find a copy of the route maps with aid stations clearly marked in their swag bag. Maps can be accessed on a smart device at www.pedalouthunger.org under the "Routes" tab. There will be signs along the route as well to help keep riders on course and direct them to aid stations. Tire pumps, food, and refreshments will be available at each aid station. The furthest aid station will shut down at noon.